Community. Select your path below. Get ready! "Get i99 Fit! get maximum impact with minimal time commitment. 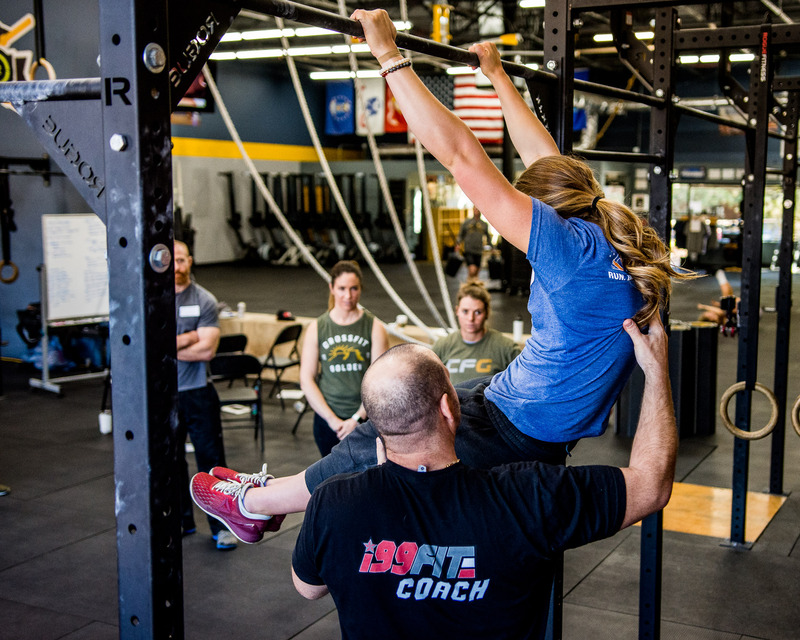 technique builds confidence and strength in all overhead movements. our very unique approach to performing the muscle-up. get ready to.... "Get i99 Fit!" Got Muscle-ups? How about efficient Pull-ups? Handstand Push-ups? Learn elite techniques for mastering complex gymnastics movements found in fitness competitions. Experience a safer more progressive approach to overall movement efficiency. I’m an Athlete… LET’S GET STARTED! Get certified to teach gymnastics to your athletes with proven techniques that instill confidence from day one. Get rapid results through physically shaping your athletes’ positions while giving timely verbal cues with i99 enthusiasm! I’m a Coach… SHOW ME MORE! Inject your community with a practical and safe gymnastics program. Your athletes will gain an appreciation for quality of their movement while your coaches get certified to deliver safe drills and determine proper timing for skill progressions. Why get Certified by @i99fit? Handstand walking cues that have really helped me: 1. tuck your chin, and look at the floor with the top of your eyes 2. Pretend there are tooth picks taped to the back of the legs so that they straighten. 3. Heels together, it helps tighten the posterior chain. Thank you @i99fit & @vanvleetd for all your time coaching us @prburke! TAG your friends that need some TIPS for walking on their hands! I've been gettin' GYMNASTY for Regionals with these guys. @i99fit (coaching me in the video) and @vanvleetd (who traveled woth Cirque D'Soleil for the last 8 years) Focusing on making my movements more efficient. That's what I love about this sport- when it doesn't "click" right away- there's always simple drills to work on! Tag your friends that LOVE MUSCLE UPS! You all were so amazing and I enjoyed every bit of the class! The mobility was great and easy to incorporate in the gym or at home. I also think all the steps broken down to do a movement is so helpful in learning proper form and technique!!! Amazeballs!!! The coaching by Dave and Duke was next level, many athletes said this was the best money they ever spent for a clinic. Awesome program!! I cannot believe how easy it is to transition multiple muscle ups now! I also loved your perspective on training handstand pushups leading into freestanding! Emphasizing gymnastics techniques also helps to work smarter and not harder. Thank you so much for all your help! This Sunday, May 25th is going to be a day NOT to miss. There will be several coaches from i99 in addition to a handful of games/regionals athletes. Last Sunday I was blown away at how much I got out of their workshop. Definitely don't miss! The course was absolutely worth it! I had high hopes of the course when I signed up and you guys blew those away. Will definitely sign up for the other clinics. Great job guys! The clinic was awesome! I learned so much about hspu and muscle ups! The ring muscle up technique is very unique, but I feel like once I get it I will become so much more efficient. The coaches were very knowledgeable and had great energy. I am so glad I did this clinic!